Milu Correch is an Argentinean graffiti artist known for her large scale murals and imagery that creates a world without limits or written codes. Milu Correch was born in Buenos Aires and after watching an amazing painting on the walls of her city, she decided to attend a mural workshop given by Lean Frizzera and Emy Mariani, great street artist from the Argentinean capital. After the workshop, she started painting in the street with friends and has made her very first mural in 2011. From the early beginning, Milu decided not to use pseudonym, but to sign the work with her full name and sometimes she even put her address! 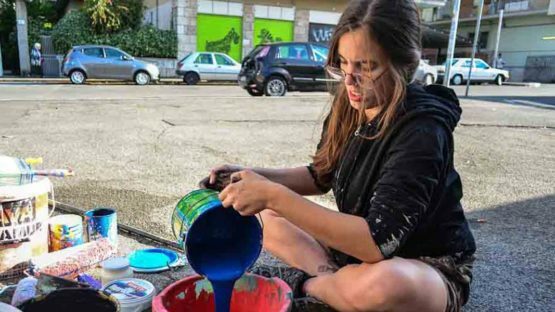 Milu is inspired by literature, movies, comics, sometimes even life itself… She is using roller, brush and water paint, the most common “tools” in Argentina; half of the street painters are working with it. With time, her walls got bigger and better. Milu even started working out of it and travelling with it. Today, while she is painting big walls, Milu is trying to get better with each painting. Construir un lugar mejor sin destruir lo que tenemos or Building a better place without destroying that we have is a project ran by Santiago Gonzalez, a Chilean muralist, and it aims to regenerate urban landscapes with street art. In 2013, Milu Correch collaborated with CULM Street Art and painted a work of Dulcinea on the water tank next to the hermitage of San Sebastián of El Toboso. This interesting initiative brought beauty to such a functional space as one water tank is. Milu managed to perfectly set Dulcinea in connection with manchego horizon. In 2015, Milu Correch, exhibited her drawings and her prints at the Birstrò Pigneto, in Rome, Italy. The exhibition was curated by a.DNA project, and the visitors could watch the artist at work for a new intervention on the road to the self-craft brewery. That same year, she was invited to create monumental murals in several cities in Spain, Germany and Belgium. The title of Milu’s a.DNA project mural is Disciples of Peter Pan – superagents children, redeeming adults from the absurd, and the four children portraits summarize the artistic experience of Milu which tends to crumble aesthetic and moral certainties with sadistic and pungent irony, through plots between Classical mythology and Romantic symbolism, revealing childhood feelings, primitive and pristine.